We have discovered, during our many years that we have been crafting and providing weather vanes, that our customers sometimes want to add an arrow to an ornament that might not already have one. 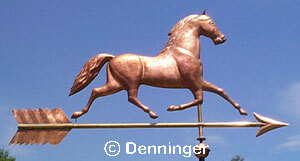 This can give the weather vane a colonial look, or perhaps a country farm look. It also will add a greater size and presence to an ornament that might be not quite large enough for your cupola, barn or tower. And it also provides a unique way to add initials to personalize your weather vane, or add a date to honor your home or business. 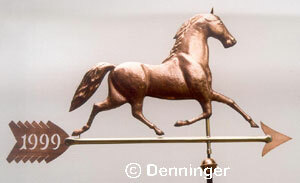 Please call us to discuss the size, options and price of having an arrow added to your Hand Hammered Copper Weather Vane. 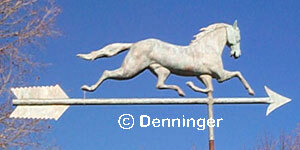 H20 George M. Patchen Horse Weather Vane with 60" Arrow and Verdigris Patina. This makes an already large weathervane huge! 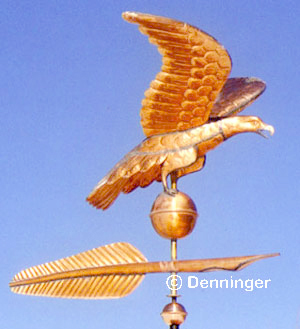 In a unique customization, at a lawyer's request, we added a Q24 Quill to this E24 Eagle Weather Vane.